July 12, 2011: Scholastic, Inc.
Whelmed. This word that's not a word is the best description for my feelings at the conclusion of Forever. Not overwhelmed. Not underwhelmed. Just whelmed. I'll start with why I'm not raving about the book. It dragged. For the first 100 pages, nothing much happened. Sam sulked. Grace was a wolf and then a human and then a wolf. Isabel complained. Cole came up with risky experiments and tried them on himself. Isabel's father was trying to get authorization to shoot at the wolves from helicopters (which sounds crazy but has actually happened). With the exception of Cole, it was all talk. The book picked up after page 150 or so - halfway through. The helicopter shoot was on and Isabel, Cole, Sam, and Grace had to race to save the wolves. Then lots happened. It wasn't a page turner, but there was a definable plot and finally some action. New characters become important. We revisited old ones. Relationships improved. Relationships broke down. The book is meant to tear at your emotions, to make you cry. To my surprise, I didn't sob at this book. There's one point were I was misty-eyed, but I never completely broke down. The previous two paragraphs make you think that I didn't like the book. But that's not true. I loved Forever. When I finished Forever, I thought it deserved 4 out of 5 stars. But Forever is a slow-burning book. It gets its claws in you and doesn't let go. In the five days since finishing the book, I've thought about it again and again and re-read certain parts numerous times. It doesn't make me cry, but every time I think about it, my chest tightens and I can't focus on anything else. For all its slowness, it's captured my heart and I lean more towards 4.5 out of 5. I can't quantify why exactly Forever touched me so much. Largely, I think it's Maggie's writing. It's cold and stark. Stand-offish in a way. But beautiful. Her prose doesn't just tell you what's going on. It makes you feel it. When Grace is a wolf, you're on four legs running alongside her. When Isabel is angry, you're furious too. There's very little humor in this book, except for the occasional sarcastic remark. I like that there was no attempt to inject levity into a situation that isn't funny at all. Yes, it's angsty, but that's what I'm expecting. I love the four characters. I admire Maggie for creating Isabel, a very difficult character to love because she's always mean. Yet I do love her. I see the beautiful person within and understand why she puts up the hard shell. I love Cole for his intelligence, the crazy risks he took, his passionate soul, his rough edges, and his leadership ability. He was the rock upon which the other characters stood. I love Sam for his emo angst, his lyrics and poetry quotations, his sad and happy childhood memories, his passionate love for Grace. Even though Grace is now a full werewolf, we still see her black-and-white, rational thought-process, her love for Sam, her role as the responsible organizer. I especially love that we spend time in wolves' heads. Maggie did a wonderful job in describing how a wolf would actually think, act, and move. I really admire her for making the characters into actual wolves, not just human minds in wolf bodies. It makes the book feel more real. Forever is a beautiful conclusion to the trilogy. It's not the most engaging read, but I connected to the characters in a way I haven't done in most recent books. I loved the ending - closure with a little room for imagination. Perhaps the reason I didn't adore Forever is that it's not Shiver. Shiver was something really special and none of Maggie's other books have achieved that level of excellence. 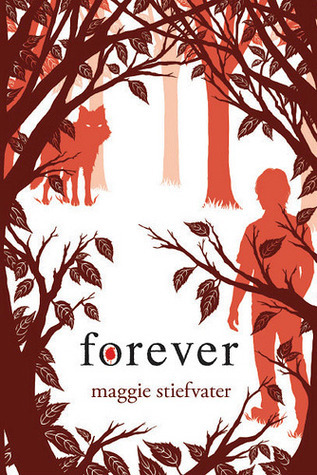 But Forever is a powerful, emotional book in its own right and a must read for anyone who loved Shiver and Linger. Glad to hear the pace picked up from the beginning. I haven't read this series yet but in all the reviews I've read for it, the reviewer always mentions the authors writing. I would really like to see what that's all about for myself. I'm sure I'll find it just as beautiful as everyone is always saying. I haven't read any of this series, but I love it when books have that kind of slow-burning effect on me. I'll often up my star rating on Goodreads after a night of pondering what I read. Great review and agree that it was whelmed but it was missing something for me. I found that it fit together to nicely and more unanswered questions. This is a great review Alison! I agreed with what you said, although I gave it 3 stars. The thing is I know what you mean about Maggie's writing. I LOVE her writing but I didn't think Forever got what it deserved. I want more from a final to a trilogy. Cole and Isabel made the book IMO, they are my favorite characters. Loved your review! I need to read the book but sort of sad too! I always feel the last book in the series is a little bittersweet. I also agree that Maggie Stiefvater's writing is simply beautiful. I have still to start this series!! I've been apprehensive about reading this one since reading PJ's (and a few others) review. It just seemed that somewhere along the way, the story lost it's magic. But your review gives me renewed hope. I probably just have to approach it a bit differently. I can do that. Stiefvater's writing enchants me. I just skimmed your review since I'm about to start it very soon, but was curious as to your reaction. Shiver and Linger also had the slow burn reaction for me too. I'm excited to find out what happens. Stiefvater's writing is beautiful and lyrical. I just finished Linger today. I didn't think it was as good as Shiver then the last few chapters and it ends of cliff-hanger. So I have to read Forever. Thanks for this balanced review. This is a good way for an author to end a trilogy. Questions get answered and all is good. I love the set. I recommend them. Forever is the third installment. Good characters and great fun.